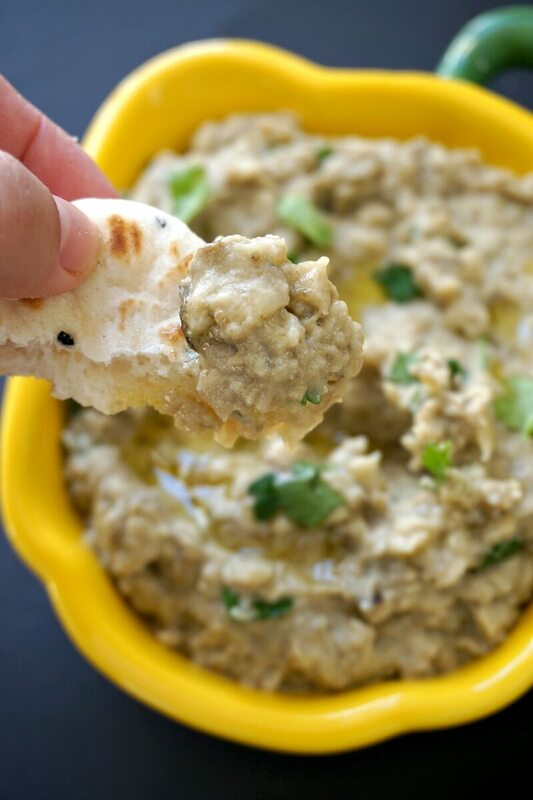 Easy Baba Ganoush Recipe, a cold appetizer for any party. It’s super delicious, and, as a bonus point, it’s vegan, gluten free and low carb too, which means everybody gets to enjoy it. Aubergines or eggplant are such a versatile vegetable. They might be in season in summer time, but they are easily available throughout the year now. 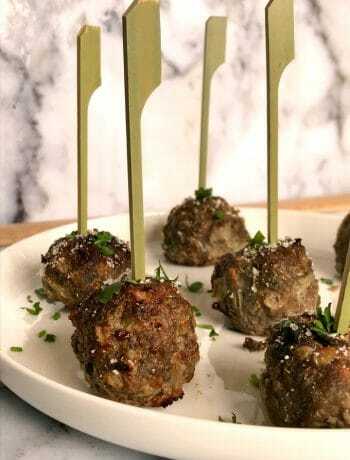 I grew up loving eggplant, and my favourite recipe ever still is the fantastic Mayo Eggplant Dip Canapés. It’s a Romanian appetizer, although we call it salad, and it’s pretty similar with baba ganoush. They both use the mashed cooked flesh of the eggplant, but while our salad uses mayonnaise to give it that rich flavours, baba ganoush uses tahini paste for its distinct taste. 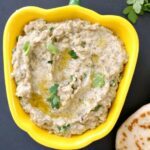 Tahini paste is heavily used in Middle Eastern recipes, the most famous one being hummus, the appetizer that needs no intruduction. And the tahini paste is actually just toasted sesame seeds that have been blended into a paste. It’s amazing how just a little bit of this flavourful paste can go a long way, it does take the humble eggplant to a whole new level. 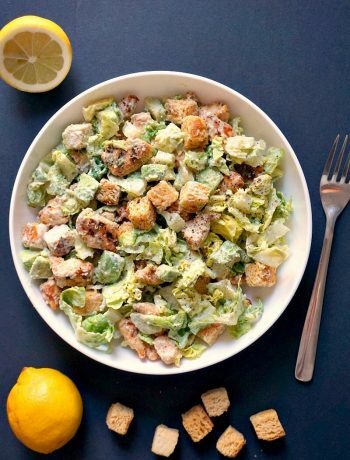 Add just lemon juice for for a zesty kick, and you know you have a fantastic dish right here for you. If it’s sound like a complicated dish, it actually isn’t. It’s super simple, and once you have the cooked eggplant, the rest is just a matter of adding the other ingredients and giving it a good mix. To cook the eggplant, you can either broil it over an open flame to get that smoky flavour, or just bake them. All we want is a soft, cooked pulp, just use the method that’s easier for you. In the oven you get the eggplant ready in about 30-40 minutes maximum. However, one you peel and chop it finely, add it to a colander to allow as much liquid to be squeezed out. 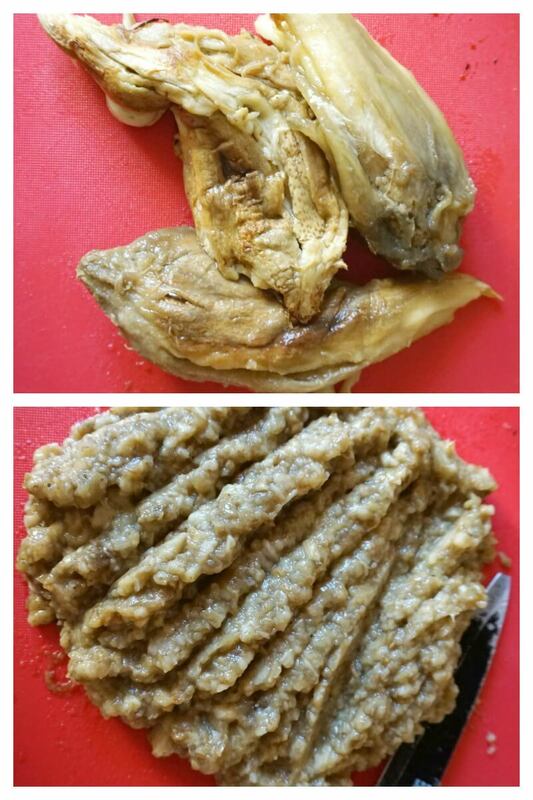 Use the back of a spoon to press down well, you’ll be surprised what a high water content eggplant have. I highly recommend not skipping this step, otherwise you’ll end up with a watery dish if you leave it to chill for a bit. 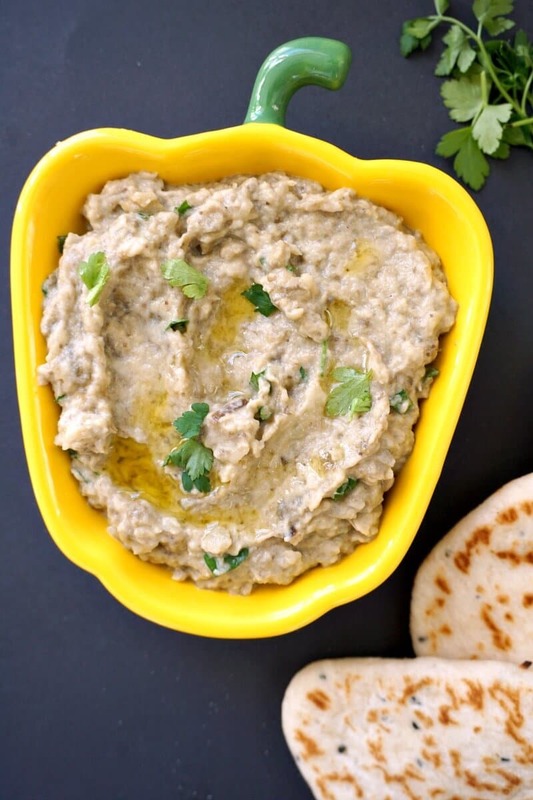 This baba ganoush is the perfect cold appetizer for every party, and it’s particularly nice in warmer weather, as chilled from the fridge is super refreshing. It’s also great for feeding a crowd, everybody will be impressed with this amazing homemade dip. If you’ve liked my EASY BABA GANOUSH RECIPE or any other recipe on the blog then don’t forget to rate the recipe and let me know how you got on in the comments below, I love hearing from you! You can also FOLLOW ME on FACEBOOK, INSTAGRAM and PINTEREST to see more delicious food and what I’m getting up to. 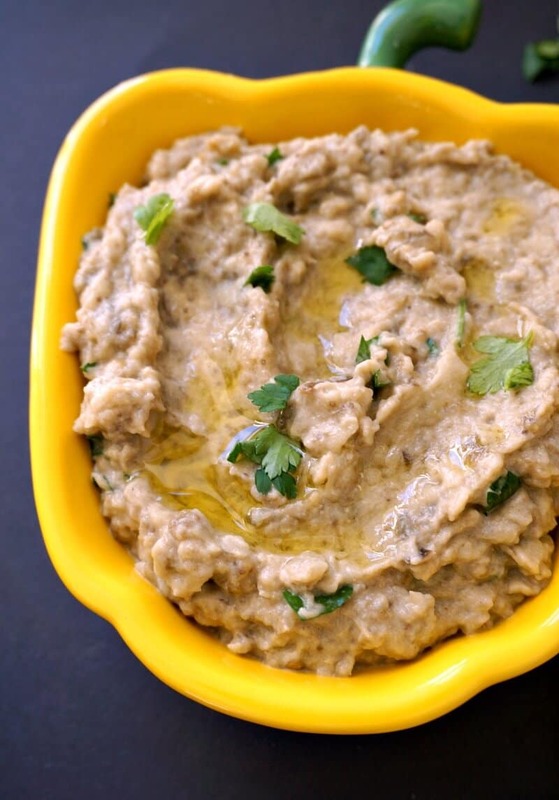 Easy Baba Ganoush Recipe, a vegan appetizer for any party. It's super delicious, and, as a bonus point, it's vegan, gluten free and low carb too, which means everybody gets to enjoy it. Pre-heat the oven to 200 degrees Celsius (390 Fahreneheit). Place the eggplant on a baking tray, and bake for 30-40 minutes until the pulp is soft. Peel and chop finely, then add the pulp to a colander. Use the back of a spoon to press down well, allowing as much liquid to be released. Transfer to a bowl, add the olive oil, lemon juice, tahini paste, minced garlic, and season well with salt and pepper. 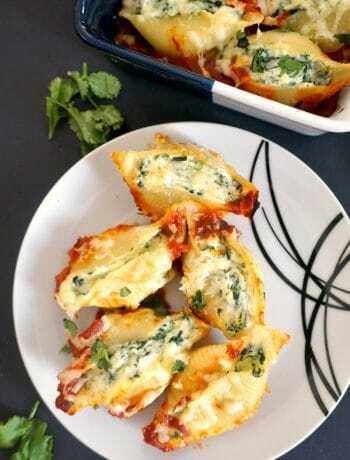 Garnish with fresh parsley or coriander leaves.